Blog Who Should I Send to Intrapreneur Academy? Who Should I Send to Intrapreneur Academy? 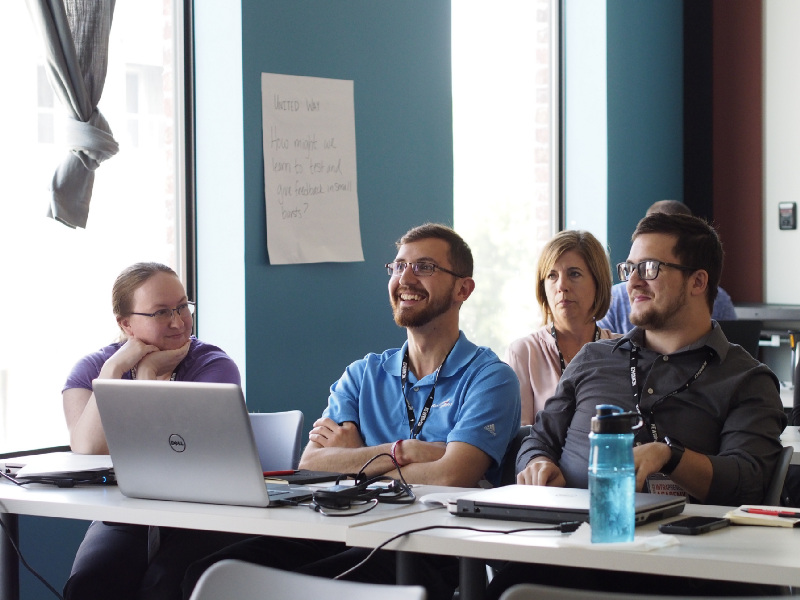 NewBoCo’s Intrapreneur Academy is a year-long program designed to help organizations of all types kick-start their innovation journey with in-depth trainings, immersive tours, and more on NewBoCo’s four innovation competencies: agile, culture, methods, and strategy. In Intrapreneur Academy, an organization sends a team of 3–8 people through as a team to learn more about these innovation competencies to inspire larger change across their organization. When we start working with a group interested in Intrapreneur Academy, one of their first questions is always about who to send through the program. While there’s no one size fits all solution for how to pick your team (just like there’s no one sort of organization that’s right for Intrapreneur Academy), we’ve identified qualities necessary for success on both an individual and team basis. Our current Intrapreneur Academy cohort followed several different theories when choosing the nature of their team composition, and we’ve seen success with all of them. The primary difference for teams came from the size of their organization. In smaller organizations, team members usually already worked closely together. For example, Woofables, a gourmet dog treat bakery, only has three full-time employees, so their entire organization actually participates on their Academy team. On the opposite end of the spectrum, Rockwell Collins employs almost 30,000 people. Their Academy team is made of people with the same role in teams across their organization who did not work together previously. In the first two months of their Academy experience alone, both teams have already found new ways to help their organizations be more efficient and innovative. Since we’ve seen success with both extremes of team composition, we’ll push your organization to focus more heavily on selecting the right individuals to attend instead of the overall team makeup. When deciding on which individuals should join your Intrapreneur Academy team, looking at their titles won’t help you. We’ve found that an employee’s role or level of experience aren’t good predictors of success in this program. Instead, qualities that are harder to measure, like drive and initiative, are far more important. That being said, top down support is crucial for success. Look for people who aren’t satisfied with the status quo. They should actively be trying to address flaws they see in your organization. Intrapreneur Academy is made for this sort of person — if they aren’t seeking to improve how things are now or interested in trying change, they may not be a good fit. They have to want to be a part of this program. This sounds simple, but it’s really important! Being in Intrapreneur Academy needs to be a voluntary commitment. This can’t be remedial training. If your organization has a designated list of “high potential” employees, that might be a great place to start! Intrapreneur Academy can be a way for you to help retain your high potential employees and keep them invested in the company. Chose someone who asks “why” regularly. Successful participants always have questions to ask and are really seeking out insight and knowledge from each other and their speakers. They shouldn’t have all the answers — and they should admit that! Don’t try to put people in Intrapreneur Academy that have a “this is the way it’s always been done” “we can’t do that” type attitude — this won’t fix that for them. Send people that want to go, see positive changes, and are excited to learn new things and take them back. We’re all busy, but the right candidate makes innovation a priority. They’re willing and able to commit to attending all workshops and tours. Curious if Intrapreneur Academy is right for you? We’d love to talk more in-depth with you and brainstorm who your team would be! Email innovation@newbo.co to set up your first Academy consultation or secure your spot today. Our next cohort starts in October 2018.